Rejection slips are part of a writer’s landscape. All authors get them at one time or another, and they usually reflect the opinion of one particular reader — often an over-worked junior employee — on one particular day. You should never take them too seriously. Fortunately, all of the following authors persevered. If they hadn’t we may never have heard of them — or their best-selling books. 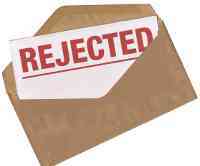 Can you identify who, and in some cases, what book, got rejected? This author finally landed a book deal after five years of continual rejections. Total sales of her books now exceed $2 billion. Only William Shakespeare has sold more books, and he had a 400 year head start.